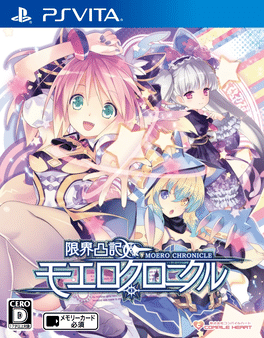 Moe Chronicle is a role-playing video game developed by Compile Heart for the PlayStation Vita and is a part of the Genkai Tokki series. The player plays as Io, an ordinary boy with a tender heart, whom village elders force to "go on a journey" to save the world from disaster. The game is a dungeon crawl game where the player is required to navigate through maps containing enemies. Battles are turn-based, and involve attacking parts of enemy monster girls so that their clothes fall off; eventually at the end of the battle, the player is required to rub the monster girl using the front and rear touchpads of the PlayStation Vita.